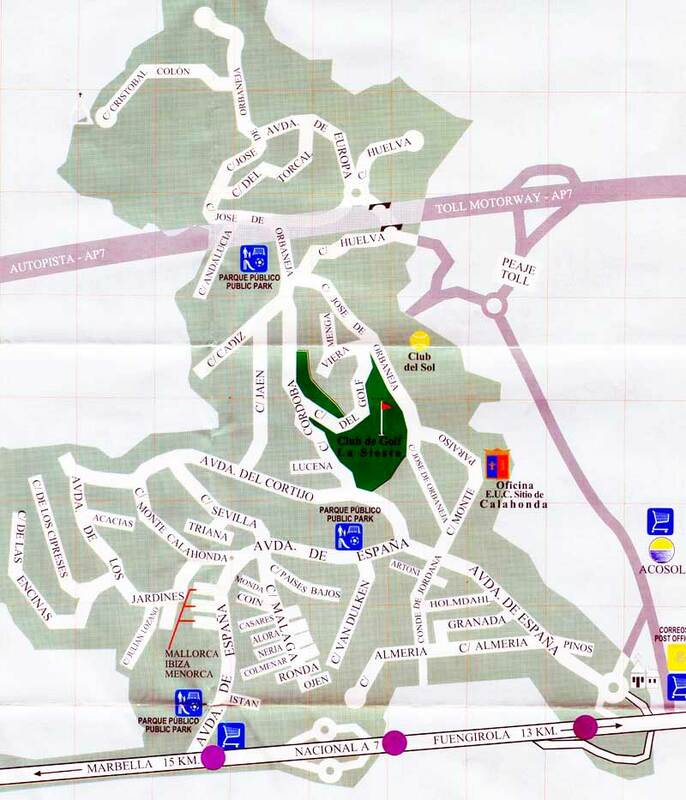 Look at the map of Sitio de Calahonda and you’ll see the A7 coast road between Marbella and Fuengirola with purple stickers showing the approximate situation of the three bus stops serving the Calahonda Urbanisation. Travelling from Fuengirola to Calahonda you’ll get off on the Calahonda side of the road and leaving Calahonda to go back to Fuengirola bus station you’ll get on to the bus on the sea side of the road. There are pedestrian overpass bridges for the first and last bus stops and an underpass for the middle bus stop. I think this is the last blog I’ll do on the Calahonda bus stops which are some of the most used stops on the list of bus stops between Marbella bus station and Fuengirola. Getting to Calahonda from different points on the Costa del Sol has always been a popular topic but over the next couple of weeks I’ll centralise all the getting to Calahonda by bus information I’ve got here on this page and hopefully it will be sufficient for future travellers. Update 15/06/2011: Did I say this would be the last post on Calahonda bus stops? Use the first stop (coming from Fuengirola) for Crown Resorts Club Marbella and the middle bus stop for Club Calahonda. Use the previous Rivera del Sol bus stop to get to the Crown Resorts Club Delta Mar, Club La Riviera and Club Caronte. Hi Asia, thank you very much for writing in. You will catch the bus which travels from Fuengirola to Marbella to go to the hospital from Calahonda and then to go home to Calahonda from the hospital you will get on the bus which travels from Marbella to Fuengirola. As you will have seen there are three bus stops in Calahonda so that will help you when you are looking for a flat. I don't think there is one ticket for a month but you can buy reduced price tickets for longer travel periods, either in the Fuengirola bus station or the Marbella bus station. Asia why don't you check out all this information and then write to me with any questions? I hope the link will help your planning a lot. – How often such bus drives ? – Can I buy monthly tickets? I would be so grateful if you hel me. I need that information to decide what apartament would be the best to rent: one in calahonda ( cheapest one) or one near hospital, where I have to get evry day for month. We would like to go and see the Christmas lights in Malaga and do not want to drive from Calahonda to Malaga and have to park the car. Could you suggest a way either by bus or train that may solve our problem. Also would we have to get off at Malaga Centro Alameda to be near the lights ?Many thanks for your help. Hi Julia, thank you for writing in. Yes, definitely take the train from Malaga airport to Fuengirola train station, it's a comfortable journey and a great way to travel up and down the coast or at least as far as Fuengirola. There are three bus stops which serve Calahonda and as far as I remember it is the middle bus stop which will bring you closest to Mi Capricho. You'll then need to use the footbridge to cross to the sea side of the road. The bus fare from Fuengirola bus station, a block from the train station, will be around €3. A taxi from the rank outside the Fuengirola train station will be less than €25. In an hour or so I'm going to drive along the A7 coastal road because my wife is going shopping at Dunnes in Fuengirola, then we are off to Cordoba, coming back on Monday. I'll check out the exact location of Mi Capricho in relation to the bus stop and if you look back on this page next week, I'll let you know what I find out in a comment under this one. There is a road train in Calahonda and I just don't know if it runs down onto the beach side of the road! Mi Capricho is in a great situation, near the beach, near bus stops and you'll be able to get down to Marbella for an excursion very easily. We are coming to Mi Capricho on 12 Feb (hoping for some sunshine!). We understand that there is a road train that runs through Calahonda. Will it be running in February? Does it go near Mi Capricho? Hi Marvelle, I hope you get this. After I had written to you above, I went on Monday afternoon to pick up my wife from Malaga airport and I explored Riviera del Sol and also called in to the Club Delta Marbella Reception which is next to the Riviera del Sol bus stop. Everything I said to you is good, except that Caronte is not nearer to the beach than the Crown Calahonda resort. It's just over a kilometre from the Riviera del Sol roundabout and another 500 metres to the sea so you would need to use a taxi to come back to the apartment from the beach especially with a young child. You could walk down in the cool of the morning, but going back would be tiring. Thank you very much for writing in. I'm sorry I can't tell you anything about the difference between the two resorts but I can tell you a little about how to get to the resorts. The Crown Club Calahonda resort is about 800 metres from the beach and a kilometre from the main commercial area of Mijas with all the bars and restaurants. You would get off the bus from Fuengirola at the third Calahonda bus stop travelling towards Marbella and it would be a longish walk up the Urbanisation Sito de Calahonda road, say 15 minutes pulling suitcases and helping the children along. If you do stay at Crown Club Calahonda, when you arrive I suggest you get a taxi from Fuengirola train station, it'll be less than €20 and it will take all the strain out of the first day. Once you've got your bearings, it'll be no problem after that to walk down to the bus stop and travel up and down the coast or use the resort courtesy bus to move around. For Club Caronte, you need to get off at the Riviera del Sol bus stop. Here is a little known secret! Instead of walking back towards the Riviera del Sol shops and main entrance and then all the way around to the Crown Resort Reception area, walk 100ms in the same direction you were travelling towards Marbella. You'll have a hedge on your right and the busy highway on your left. If you look through the hedge you'll see the Crown Resort Reception building. At the end of the hedge, there is a rickety plank and if you walk across the plank and up a short path, you'll come out into the Reception car park. The entrance to the Reception is not more than 100 metres from the bus stop but if you walk around by road it is about a kilometre. If you don't need to go to Reception first and have been told to go straight to the apartment, then walk the other way from the Riviera del Sol bus stop and you'll see a taxi rank. For a minimum fare a taxi will take you the short distance straight to the apartments. The Mijas shopping centre which I mentioned above is only another 300 metres along the main road from the Riviera del Sol bus stop. The sea is just on the other side of the road, of course you'll need to to use the underpass to get to the beach. Club Caronte is also close to the Riviera del Sol shopping centre right next to your bus stop. It's also closer to the beach than Crown Club Calahonda. On one day you could bus back into Fuengirola and the children would enjoy the Aqua Park or perhaps a visit to the Fuengirola Zoo. Marbella is the other way by bus, have a look around in the Old Town before taking a ferry from the Puerto Deportivo in Marbella to Puerto Banus. From there you can taxi back to Marbella or take a local bus back to Marbella centre before catching the Fuengirola bus back to your resort. Marvelle I hope it all works out OK and that this has given you an idea of where the resorts are and how to travel around. Thanks again for writing in, best wishes from Marbella and I hope you have a great family holiday. Thinking about a last minute trip with my husband and children next week. We are looking at staying at vacation condo Crown Resorts at club Caronte or Crown Resorts at club Calahonda. Do you know anything about either? It looks like we can take the train from Malaga to Fuengirola then a bus to Calahonda. Which bus/stop should I take to get to the resorts? Really sorry I let your message slide down in my email basket. I found it by chance when I did an alphabetical search and it came up as Zak at the top. Sorry. It's no problem at all commuting from Calahonda to Marbella centre, the buses run every thirty minutes on that route which is the Fuengirola to Marbella service. you see how the system works. Sorry again about the delay, please ask any more questions that I can help you with. I hope your job and stay go really and you are tempted to stay on. I don't suppose you would know how long (and whether it is an easy route or not) from Sitio de Calahonda to the centre of Marbella? We are moving there this summer for work! There are two parts to your journey from Miraflores to Mijas Village. First of all catch the bus from Miraflores to the Fuengirola Bus Station. To see exactly where the Miraflores bus stop is, just look for – Miraflores Bus Stops – in Google or your favourite search engine. You'll find my page showing you exactly where the bus stop is. I hope it has been cleaned up since I was last there. The buses come by at 30 minute intervals. You'll be catching the Marbella to Fuengirola service so cross the footbridge and stand on the sea side of the busy A7 coastal road. It'll take you about 25 minutes to get to Fuengirola. The second part of your journey is from Fuengirola bus station to Mijas Village, also called Mijas Pueblo. There are a good number of buses leaving Fuengirola at intervals from 20 minutes up to an hour. The journey up the mountain side to Mijas takes 25minutes. If the timing of your journey is important, just Google – Mijas Bus Schedule – and you will see my page on buses along the Costa del Sol, you'll find the Marbella schedules, just add 25 minutes onto the departure from Marbella bus station to give you the approximate arrival time at your Miraflores bus stop. On that same page you'll find the Mijas Village schedule. I hope that helps you Sheila, thank you writing in, if you would like to share anything about your journey with other readers, please just let me know! Hi Karen, it's actually not straightforward to find the exact information you need to move around easily on the Costa del Sol so don't feel you are using the wrong keywords! I was thinking after I last wrote to you that when you travel from Fuengirola to Malaga train station to connect with the bus station, you will be getting off at the second last stop on the line which is the Malaga Maria Zambrano train station. The last stop is a little way further on, almost in the centre of Malaga. If you are still feeling fresh after your outing to Nerja and don't feel like going straight back to Fuengirola, when you get back to the Malaga bus station, cross over to the train station and take the train onwards to the last stop, the Malaga Centro Alameda. It'll save about a 15 minute walk. From there explore the centre of Malaga, have a look at the Cathedral or the Roman amphitheatre just behind it. For dinner there are lots of really smart but well priced restaurants in the area or just have a drink or two and a few tapas. Then make your way back to the Malaga Centro Alameda stop and train in comfort all the way back down the line to Fuengirola. You can leave on the last train out if you are having fun! From any kiosko (pavement shop) you can pick up a Plan Callejero – Street Map of Malaga for a few euros or just print off a a Google map of the area before you travel. On the map it looks as if the distances are big but in fact the streets are all very close together. How does that sound? It all depends on your energy levels but I can see you have just the right spirit for your outing. Best wishes again Karen and please write if you have any questions or just to let me know how it went. Thank you very much for writing in. My first thought is that you can take the train from Fuengirola train station to the super smart Malaga María Zambrano train station, there's a train every 30 minutes and then walk next door to the bus station to pick up your bus to Nerja. The Alsa bus company handling the Malaga to Nerja route operates a good number of services each day from Malaga bus station, right to the caves. You can book comfortably online in advance with Gomarbella and travel from Malaga bus station to Nerja. You’ll see that buses leave at intervals from 30 minutes to an hour apart. A return ticket costs €7.17. Having said you would like to be independent, you could take some time off on the way there or on the way back to have a drink or a meal in the upstairs restaurant section at Malaga train station or even do some shopping in the commercial gallery at the station. Take care around the bus station with your belongings, buying your tickets and getting on and off the buses. I give this advice to everyone travelling, it's not just for Malaga bus station. Have a great outing with your sister Karen and thank you very much again for reading the blogs! It sounds as if you both need a really good holiday in the sun. Just keep focussed on July, a big paella on the beach with a glass of cold white wine and the time will fly by. I'll check out that last bit for you in the next couple of weeks and let you know via this blog. It may appear a bit further down but I'll do it. Thanks very much for writing back and have a good rest tomorrow!" Thanks very much for writing in. You are absolutely right about that route: Shuttle bus from Malaga Airport to Marbella bus station and then a local bus back along the coast to Fuengirola. This second bus will take you past the Don Carlos bus stop which is your Nikki Beach get off point and then go on to Cabopino. Please note that the airport bus travels inland on the toll road and does not stop anywhere along the route before it gets to Marbella. The other route you might like to try is to take the train from Malaga Airport to Fuengirola train station, then walk a couple of hundred metres to the Fuengirola bus station. From there take the bus to Marbella along the coast which will drop you neatly at Cabopino. This is the same bus you will get on at Cabopino to take you to Nikki Beach. I guess it's six of one and half a dozen of another choosing between the routes but if you take the train then the bus, at least you are travelling in the same direction the whole way. Also the train leaves every 30 minutes so that might suit you better than the airport bus which is on the winter schedule in March and the buses to Marbella leave with less frequency. Look after your luggage and hand luggage all the way when buying tickets and getting on and off the train or bus. I got back from London last night and the weather is fantastic, very sunny, pack your bikini! Let me know if I can help at all Jessica, thanks again for writing in. Best wishes from Marbella and have a great stay.